Desperately Seeking Susan--I know, this one's a bit out of left field. Imagine, though, how awesome it would be to play an 8-bit, '80s-themed RPG based on this Susan Seidelman-helmed dramedy? Sure, the obvious choice for such a movie-to-game conversion would be to copy Where in the World is Carmen Sandiego? or even the Professor Layton titles, but I think a more creative option would be to make it a sort of musical RPG--in which the player, controlling Roberta (Rosanna Arquette), has to explore New York City in an effort to find the titular Susan. Along the way, she fights off--using rhythm-based attacks à la the magnificent Mother 3--bartenders, hobos and rats while gathering clues about the whereabouts of the mysterious object of her obsession. Oh, and the final battle could be a DDR-esque dance-off to the tune of Madonna's "Into the Groove." Fame--Speaking of dance-offs, wouldn't it be cool if one of these of-the-moment dance-based games--think Dance Central or Just Dance--was supported by an actual story? In this example, players choose to control either Leroy or Lisa and then have to make their way through a series of auditions, practices and performances that are interspersed with theatrical story segments. Now, don't worry if the idea of a Fame game doesn't really trip your trigger--really, it could be replaced with the musical of your choice. For instance, wouldn't a similar game based on Moulin Rouge or Chicago be a blast? Hell, I could even see a story-based dance game based on Evita being pretty cool--you know, with Latin-inflected choreography set to songs like "Buenos Aires" and "Rainbow High." The Hunger Games--First of all, if you've yet to read Suzanne Collins' sci-fi trilogy, go out and buy it (and then read it, obviously) right now. After you're done, you'll have a much better understanding as to why I think this post-apocalyptic tale could make a great game. (For those of you who have an aversion to anything and everything sci-fi, the gist of The Hunger Games is that each year, in the fictional nation of Panem, 24 children are forced, after being selected lottery-style, to fight each other to the death in a variety of outdoor arenas.) Anyway, I could see this book-to-game conversion being fairly straightforward, with Poy Poy-ish (but darker) battle scenes broken up by RPG-esque scavenging segments--during which players search for and possibly create, using the materials around them, items and weapons that can be used in the next arena. 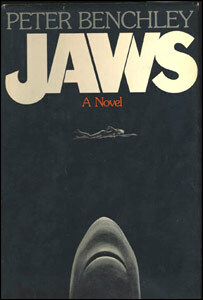 Jaws--It's kind of amazing how few Jaws games have been released over the years. In fact, I can think of only two: LJN's NES effort from 1987 and Majesco's Jaws Unleashed from 2006. Neither game seems to be all that inspired, however, which is a shame given the source material. How would I turn things around? By making the game a fishing-investigating-RPG mash-up, that's how. Here's how I see it playing out: Gamers are put in control of oceanographer Matt Hooper as he hunts the titular great white shark (which serves as the title's final boss, obviously). At the start, Hooper has nothing but a tiny ship. In order to make enough money to buy a bigger boat and better equipment, not to mention hire much-needed crew members, he catches fish, ferries tourists, helps the Amity Police Department with their investigation (by finding the bodies of those attacked by Jaws) and searches for sunken treasure--all of which are interrupted, RPG-style, by random battles with dangerous sea creatures and nosy citizens. As crazy as it may sound, I've also come up with ideas for game adaptations of The Road and Run Lola Run, but they'll have to wait until another day. I really love your idea of a Dance Central-type game with a story attached. I'm kind of amazed that type of thing hasn't been attempted before, because it'd feel like being in your own musical! While that PROBABLY wouldn't have a feasible game to be published a few years back it certainly would now. Reading it actually makes me think that someone is going to capitalize on it soon. At least, they'd better or else the dance genre will get pretty stale quickly (says the guy who has played and loved dozens of DDR iterations). Ah, I'm glad you liked one of these silly ideas. Actually, most of them were half-silly and half-serious. I don't really want a Desperately Seeking Susan game, for instance, but I do like the idea of mixing genres a bit -- like, dance games with stories or musical RPGs. Anyway, I agree with you that a dance game supported by a story is coming soon. Hopefully it'll be a well made one! The Road could be a good computer game. I guess I am alive will fill that void somewhat. Looking forward to it. The world needs more post-apocalyptic games without constant shooting. Slaughterhouse 5 could also become an awewsome video game experience. I'll echo Marcus's comment. What a fantastic idea! Chicago, the game! I'd need to dust off my fishnets. Speaking of fishnets, what about Rocky Horror? That could make an AMAZING 8-bit adventure game. Anyway, you're right -- I definitely want a more thoughtful post-apocalypse game. Why do they all have to be like Resident Evil or be FPSes? Oh, and I've never thought of Slaughterhouse 5 as a game. That *would* be awesome! Justin: Yes, Rocky Horror would make an *awesome* game. Why have we not seen one yet??? Hey all, for I Am Alive there are also games in the "Disaster Report" series which are very similar and actually have come out! The more I Am Alive is kept secret with little to no news for years the more I assume it won't ever come out :(. As for Rocky Horror, I would be all over that! And as far as I know, there was a game based off it once (The Rocky Interactive Horror Show) but there was no actually dancing on your part required, although I suppose you could do the time warp in front of your computer. Thanks, Marcus. Sounds like I'll have to check out the "Disaster Report" games, too. I've heard of them, but never played any of them. *GASP!!!! * What? See it. Now. Yeah, I can't believe I haven't seen it -- esp. since my sis-in-law is a HUGE fan. Don't worry, I'll see it soon.